We're no stranger to homemade ice cream. On a scale of not-worth-your-time-buy-store-bought and I'm-never-buying-store-bought-again-where-has-this-homemade-version-been-all-my-life?! homemade ice cream is tipping the scales at the latter. There's just something about simple, real ingredients, no fillers, no preservatives, not chalked full of air, no stabilizers to keep it from melting - just pure real ingredients with a far superior taste and texture. Last summer we made peach bourbon pecan cobbler ice cream and then we celebrated fall with cinnamon apple pie ice cream. We're a house divided between dairy-free ice cream and traditional. I've pretty much perfected the thick creamy consistency without dairy and with so many dairy-free store bought versions tasting just so off, I am such a sucker for a good homemade dairy free ice cream. The secret, like most delicious creamy dairy-free desserts, is in the coconut milk which when combined with coconut cream pretty much gives you the exact consistency of heavy cream without ever having the milk a cow. Other than that, this recipe is pretty straight forward, classic. Every now and then I think it's good to get back to the basics. And because there are probably one million vanilla ice cream recipes out there, but only a handful of dairy free ones, I'm throwing my hate into the ring with this recipe. It makes the perfect base for throwing in chocolate cookies for cookies and cream, seasonal fruit, jam, or even specks of melted chocolate. It's a staple for topping over cobblers and pies or just dunking a spoon into when it's super hot out. Oh, and be sure to check back next week because we're doing something super fun with it. My husband's been gone back and forth traveling for work since May and just came home, so I'm looking forward to spending the 4th as a pack, just the three of us. We're making Alexandra Cooks' peach pizza, which I've deemed a 4th of july tradition and smitten's zucchini crisps with sangria and this ice cream. Happy 4th! Prepare a double boiler by bringing 1-2 inches of water to a gentle boil in a small sauce pan topped with a heat-proof bowl. Be mindful the water doesn't actually touch the bottom of the bowl. Over medium-low heat, whisk sugars, egg yolks OR cornstarch and 1-2 tablespoons of coconut milk to loosen in the heat proof bowl for about 3 minutes until the mixture thickens and the sugars melt. Pour in the coconut milk, followed by the coconut cream and whisk. Slice open the vanilla bean and using the backside of a knife, scrape out the insides. 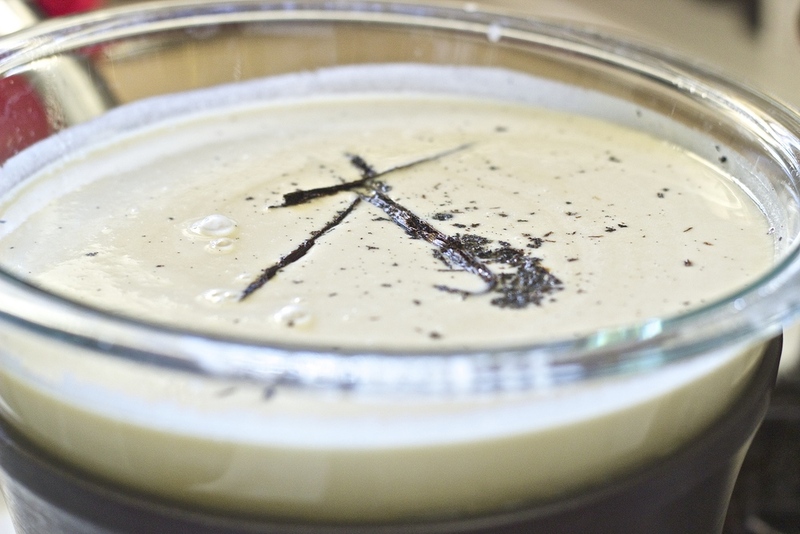 Toss this vanilla bean "caviar" along with the vanilla bean pod and a generous pinch of salt into the coconut mixture. Continue to whisk for about 5 minutes. Remove from heat and let cool slightly. Pour the mixture through a fine mesh sieve and discard the remnants. Cover and refrigerate for at least 2 hours. Pour the cooled mixture into your ice cream maker and follow manufacture's instructions. Once the ice cream comes together it will be the consistency of soft serve. If you like it a bit more firm pop in the freezer before serving. Egg yolks v. Cornstarch. Traditionally creamy custard style ice cream is made with egg yolks. Upon researching vegan alternatives I discovered cornstarch acts in a very similar way. I made a batch of each, expecting the egg yolk batch to come out creamier. We did a blind taste test and couldn't tell a difference. So we'll leave the decision up to you! Not into either? You could skip on both, the ice cream will just be more icy less creamy. Coconut cream? I buy it from trader joe's and it's only slightly thicker than regular full fat coconut milk. If you can't find it just go with two cans of coconut milk and you'll be fine. Definitely avoid light coconut milk here, we're making ice cream, and it will come out super icy. We have this ice cream maker. It's pretty great.